F RANKLIN - Beth Dahlstrom walks everywhere - from her house to downtown to the coffee shop. And she sees a lot of other people walking around town, too, especially in Franklin’s center, near the MBTA stop off Depot Street, and around the leafy Dean College campus. So imagine her surprise when the website walkscore.com rated Franklin one of the state’s “least walkable’’ communities. Over the past several years, the concept of walkability has been reintroduced as a key component of economic development, particularly in the suburban setting. And, as communities look to foster more foot and bicycle traffic in their downtowns, some people are, quite literally, keeping score. The website Walk Score ranks cities and towns on their pedestrian-friendliness by awarding points based on the distance from housing to amenities. For example, shops and businesses within a quarter-mile of housing receive maximum points, while those more than a mile out receive none. 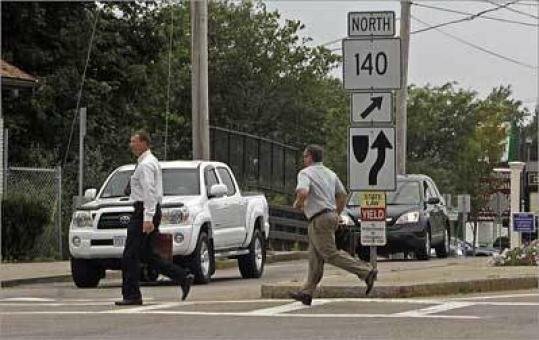 Franklin’s low walkability score was part of the website’s recent ranking of all US cities and towns with populations of 15,000 or more, separated out by state (72 in Massachusetts apply). Joining Franklin at the bottom were Wilmington and Agawam, while on the other end of the spectrum were Somerville, Brookline, and Cambridge, which tops the state list. Website cofounder Matt Lerner pointed out that Walk Score is used by about 10,000 other websites, as well as many real estate brokers. Others, though, treat such rating systems with skepticism. In fact, said Metropolitan Area Planning Council transportation planner Alison Felix, the scores should “be taken with a grain of salt,’’ as the site’s algorithm doesn’t take into account topography or street characteristics. That formula will be changing, however; the Seattle-based website is working on a new system that will include more analysis of the underlying road network, as well as the average length of blocks, the placement and layout of intersections, and how wide and fast the roads are, Lerner explained. That’s something Franklin is certainly doing. “We do realize that there are issues with our downtown,’’ Dahlstrom acknowledged, noting, among other things, deteriorating and crumbling sidewalks. Still, she said, the town is doing “quite a bit’’ to promote walking. For starters, it’s engaged in a $7.25 million multiyear downtown roadway improvement project. Fueled by a mix of federal, state, and town money, the endeavor is expected to improve roadways, vehicle circulation, and the overall appearance of downtown, as well as make it safer and more appealing to pedestrians through widening of sidewalks and the addition of bike racks and benches, Dahlstrom explained. Likewise, the town has eased downtown zoning regulations to allow for mixed-use development in hopes of creating a more active center with intermingled housing and business. Meanwhile, Franklin - along with Milford and Northborough - will soon be getting some guidance and training from the nonprofit Walk Boston, through funding from the Metrowest Community Health Care Foundation. The project is just getting started, according to Wendy Landman, executive director of Walk Boston - which has worked with about 50 communities in various capacities, from creating walking maps to providing pedestrian safety education. The plan is to perform “walk audits’’ in each community. Those involve walking around and examining various factors, she explained, including sidewalk conditions, intersection placement and geometry, efficiency of pedestrian lights, presence of trees, and availability of shade. The goal is to provide technical assistance to various municipal departments that play a role, such as the senior center and the public works department, so they can collectively work together to improve walkability. “Walking is a little like motherhood and apple pie - everybody thinks it’s a good idea,’’ said Landman, noting its positive health, environmental, and economic impacts. Similar efforts are underway around the town’s schools. Some, like Oak Street Elementary, already have an active walk-to-school program. “Some of the schools are very walkable,’’ said Lauren Marciszyn, youth and community wellness director at the Hockomock Area YMCA, which works with schools on such programs, and is currently reaching out to them in hopes to do walking audits. But ultimately “there are barriers to people walking,’’ she said, whether it’s lack of time or questions of safety, such as too-few crossing guards or lack of sidewalks. As Felix noted, between 1969 and 2001, the number of students age 5 to 18 who walked to school declined by more than half - dropping from 42 to 16 percent - while the number driven to school more than tripled, jumping from 15 to 50 percent. “I certainly would not pick on Franklin; it’s the nature of their community type,’’ said Eric Bourassa, transportation manager with the Metropolitan Area Planning Council. It comes down to smart growth, said Bourassa, or creating an area where housing, retail, shopping, businesses - and ultimately, jobs - are all located in close proximity.